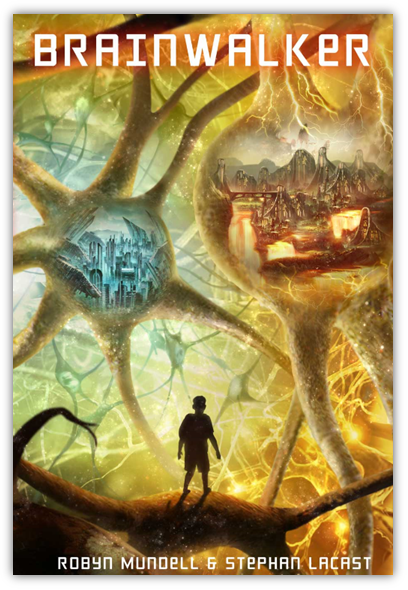 In the first chapter of the science-fantasy novel Brainwalker, our hero Bernard has a heated discussion with his dad about how all matter is energy, and all energy matter. This has been expressed years before by Albert Einstein in his brilliant equation, e=mc2. But if it’s true that all matter is energy, it brings up some big questions: how come solid matter can’t pass through other solid matter, the way two beams of light just go through each other? Why do we go around barking our shins against table legs, instead of just phasing through them the way the Vision does in the Avengers? Why can we stand on the ground instead of just falling through the Earth’s crust straight down to the core? Good questions, and as with anything that has to do with reality at the quantum level, the answer is both weird and complicated. First let’s set the table. As you well know, matter is composed of atoms, which are themselves composed of smaller particles: electrons (which carry a negative charge), protons (positive charge) and neutrons (no charge). Electrons and protons are attracted to each other due to their opposing charges. Hence you have electrons orbiting protons in the nuclei. On the other hand, electrons repel other electrons because they have the same negative charge. These are the properties of electromagnetic force, one of the four elemental forces that make up the universe. Solid objects, of course, are made up of trillions of atoms, each with their own electromagnetic force. And so the EM force present in a leg chair will repel the EM force of your shin in the event of a collision, and, well, you won’t be able to spare yourself some pain. So to go back to the book Brainwalker’s discussion, yes, matter is energy and vice versa. The mug on your table is being held up by energy, floating on a vast sea of electrons! It all seems strange, but as you will see as you go deeper into the quantum level, the world gets stranger still.